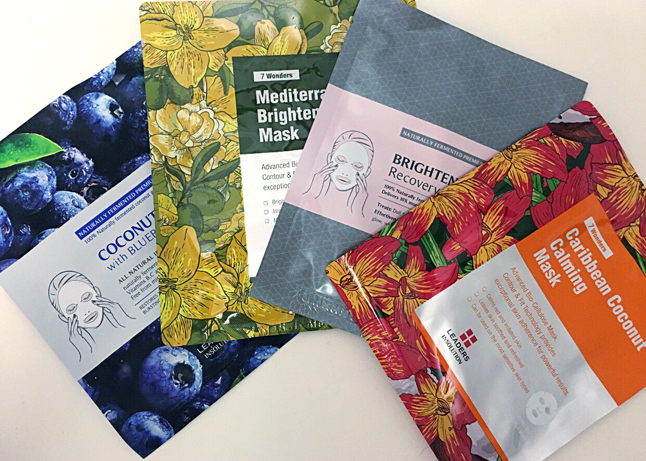 (Irritated, Red, Dry Skin) BioRepublic Aloe Rescue Mask – Packed with healing aloe vera, plumping phytocollagen, and nourishing vitamin E, these biodegradable fiber sheet masks are just what your dry skin needs, especially after sun exposure. They’re free of parabens, sulfates, and phthalates, and aren’t tested on animals, so you can breathe a little easier-even if you forgot our sunscreen that day (*tisk tisk*). (Irritated, Dry Skin) MaskerAide Weather Warrior – Exposure to damaging elements such as harmful UV rays, wind and extreme cold can leave your skin dry, flaky and screaming SOS! Apply the weather warrior mask with Aloe, Green Tea, Witch Hazel and Argan Oil to help soothe, calm and heal your skin allowing it to breathe a sigh of relief. 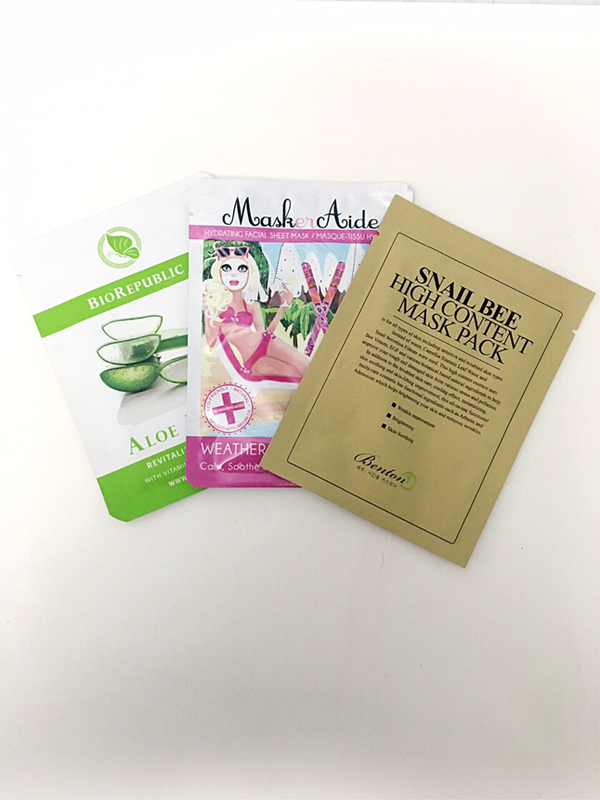 (Dull, Aging Skin) Benton Snail Bee High Content Mask (Set of 10) – This face mask is fully immersed in a highly concentrated essence infused with snail slime filtrate and bee venom. Don’t be scared! The premium blend of natural ingredients makes the skin’s immune system stronger to be able to stand against daily exposure that often leads to skin damage, enhances elasticity, softness and radiance. 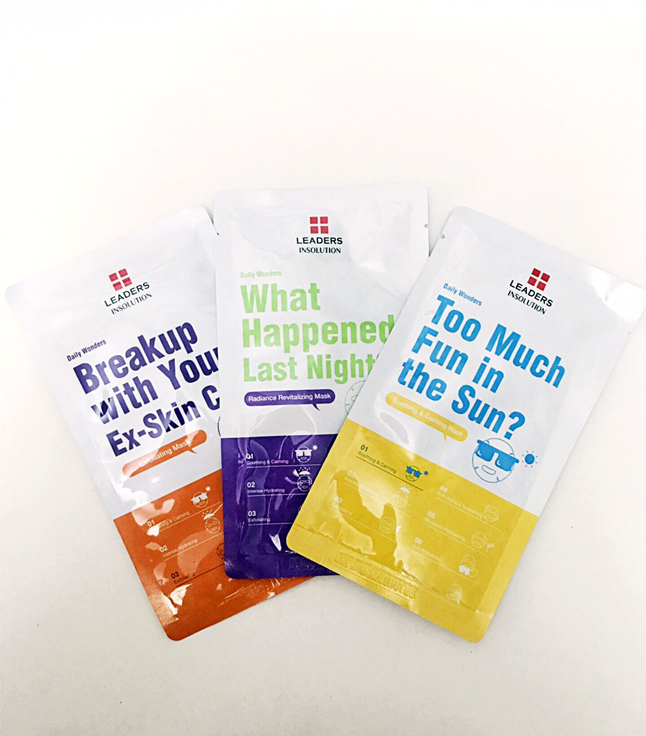 (Dry, Aging Skin) Leaders Daily Wonders Break Up With Your Ex-Skin Cell Mask – This spa-in-a-sheet mask contains blueberry and edelweiss extracts to visibly minimize fine lines and rough texture, making skin more youthful, smoother and firm. (Dull Skin) Leaders Daily Wonders What Happened Last Night – This radiance revitalizing sheet mask contains ginseng and Artemisia extracts to revitalize and soothe skin, leaving it more radiant, dewy and refreshed. (Dehydrated Skin) Leaders Daily Wonders Too Much Fun In The Sun? – After a day in the sun, treat redness, irritation and dehydrated skin with cactus and butterfly bush extracts to intensely hydrate. (Dry Rough Skin) Leaders Coconut Gel Mask with Blueberry – This mask features blueberry, rich in Anthocyanin, vitamins and fatty acids to restore skin to its youthful resilience. Protect your skin from further damage and ensure that it’s at full moisture potential to ensure skin health is well maintained. (Troubled, Dry Skin) Leaders 7 Wonders Mediterranean Olive Brightening Mask – Remedy troubled, dull, tired, uneven skin with this brightening mask rich in healthy fats and phenolic antioxidant Vitamin E, and olive oil to rids skin of free radicals and repair existing environmental damage. (Uneven/Discolored Skin) Leaders Brightening Recovery Mask – The Brightening Recovery Mask is an illuminating bio-cellulose coconut gel mask that brightens dull and uneven skin tone while improving complexion and reducing discoloration. With continuous usage, the mask systematically restores luster and vitality to the skin. (Irritated, Red Skin) Leaders 7 Wonders Caribbean Coconut Calming Mask – This bio-cellulose sheet mask enriched with Caribbean Coconut soothes irritations and reduces redness. It also evens out tone while cooling skin overexposed to the sun, leaving skin overall calm and cool.